Universal Rotary Mower Blade and Tool Sharpener. Re-sharpens all types of metal rotary blades, and re-edges spades, hoes etc. The high quality aluminium oxide, angled wheel produces sharp new cutting edges on rotary mower blades, to the correct angle, in minutes. 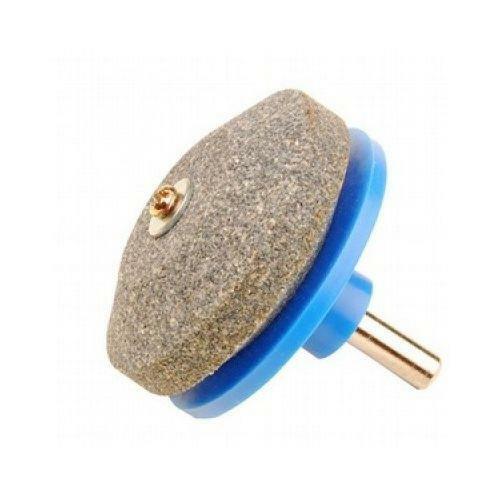 The wheel is reversible to give around 10 re-sharpenings, for many years use. * Fits any power drill, including cordless. * Also puts back a keen edge on spades, hoes, lawn-edgers and axes, making them much easier to use. Feedback for UNIVERSAL Rotary Mower Blade and Tool Sharpener has been compiled from 7 reviews.